Bardons & Oliver is excited to announce our newest addition to the Rotating Head Series Cut-off Systems. B&O’s RH450HP Rotating Head Cut-off Lathe is a completely new machine built for small, lightweight, extremely FAST tube processing. Designed specifically for thin wall tubing ranging from .028” (.71mm) to .312” (7.94mm) wall thickness, tubing diameters from .750” (19.05mm) up to 4.500” (114.3mm) diameter. Our integrated material handling system includes a fully automatic raw material bundler/unscrambler loading table. Cycle times ranging from 6 to 8 seconds part to part. 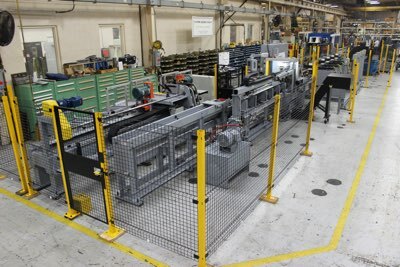 With full wrap work holding, the machine will not deform tubing, providing clean cutoff parts with nearly zero kerf by utilizing 3mm cut-off blades to minimize material loss. When paired with our high-speed double end fully automatic chamfer system, it’s capable of both OD and ID chamfers on both tube ends resulting in concentric chamfers. Add a fully automated robotic unloading with a palletize system, B&O’s newest machine will minimize operator intervention, thus reducing labor costs. Please contact any one of our Sales Team Members for additional details and machine capabilities.